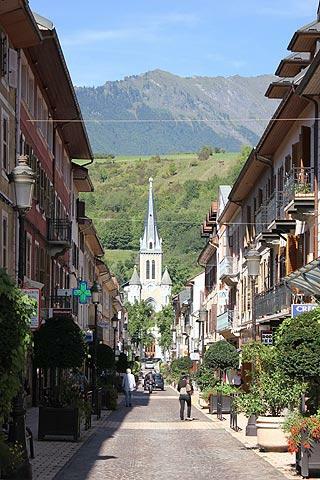 The town of Albertville and the nearby village of Conflans are situated in the Savoie department of the Rhone-Alpes. 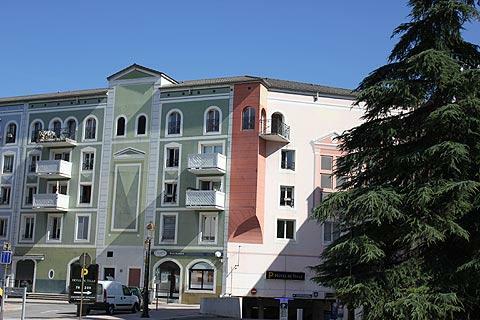 It is as a mountain and ski region that Albertville is best known, especially since the town played host to the 1992 Winter Olympics, and several mountain regions are found nearby including the Bauges and the Beaufortain ranges. Albertville is classed as a town of Art and History and whilst it is not really a tourist destination it is reasonably attractive and is in a very picturesque setting with a backdrop of the mountains and has easy access to outdoor activities such as mountain biking, horse-riding, walking and trekking etc. It is also just a couple of kilometers from the medieval village of Conflans which is well worth the short drive if you are here. 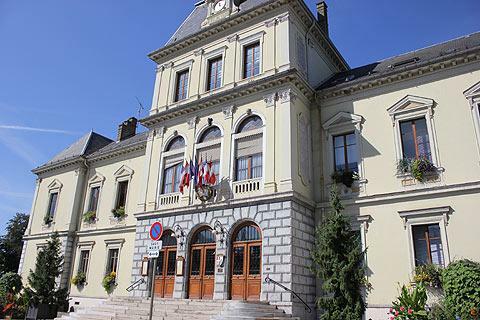 The centre of Albertville is based around the neo-classical town hall (built in the late 19th century) and the adjacent Palce de l'Europe. The Place de l'Europe is a modern centre in an unusual kind of modern neo-classical style. This square is bordered with cafes and shops and the original Palais de Justice. Above the square the mountains almost look like they have been painted on! 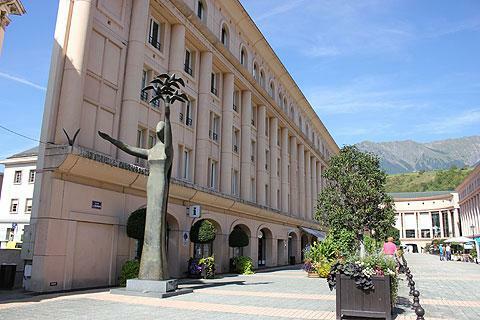 Near this square is the Rue Gambette which is an attractive paved street with views straight down to the church of Albertville, and again a backdrop of mountains adding dramatically to the view. There are a few other monuments from the 19th century to be seen in the town, such as the Hotel Geny and the Church of Saint John the Baptist - the neo-gothic church you can see dominating the end of Rue Gambetta. There are also several museums including the House of the Olympic Games which is housed in the old Palais de Justice. The Olympic House has an exhibition about the 1992 Winter Olympic Games hosted in the town. It is possible to visit the olympic park as well. There are otherwise few traces of the long history of Albertville which dates back to its role as a Roman frontier town, within Albertville itself, and most visitors will go to explore the medieval part of the town, Conflans. Conflans is just a couple of kilometres up the hill above Albertville. It is a picturesque village and in its main central square there are lots of boutiques and cafes - it's a lovely place to stop for lunch. The village has some interesting medieval buildings, the highlights among these are the red-brick buildings of the Chateau-Rouge and the Maison Rouge, and the streets lined with houses dating from the 17th-18th centuries. There is also a small 18th century church in Conflans, the Church of Saint-Grat. The Chateau Rouge is home to the museum of Art and History and has exhibits of life over the last 2000 years in the area as well as art from the region. When you have explored the village you can follow the signs to the panoramic view. 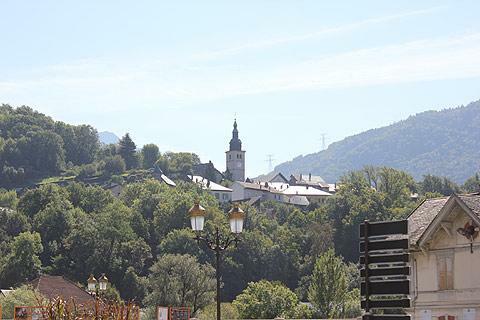 At the viewpoint there is a Sarrasson tower, a sturdy stone tower being the remnants of Conflans castle, a public garden and some excellent views over Albertville and the surrounding countryside. The attractions here are the outdoors and related activities, with numerous ways to explore and enjoy the mountains. 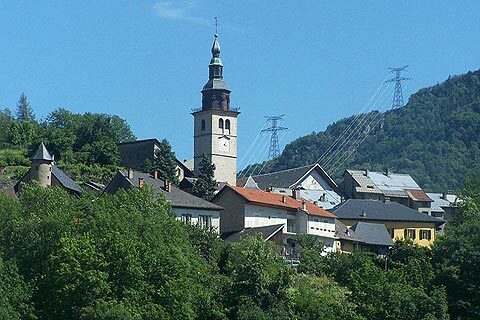 Most of the towns and villages in the region are best known as ski resorts and include Meribel and Courchevel to the south and Beaufort to the east. 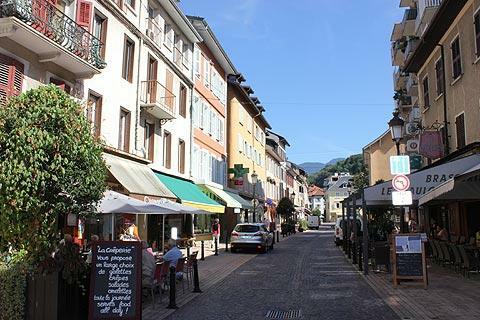 You will also want to visit the pretty villages around Lake Annecy while you are in the region - see the guide to Lake Annecy - as well as the lovely city of Annecy.